Not sure if this is a 'she' or a 'he' but is this year's fawn from a doe that was hit and killed this last late summer. Somehow this little sweetie has survived alone and comes to eat the bird seed (and other things like apples we leave out) each morning. Since this picture was taken, another two feet of snow has fallen. As this is Christmas Day, I thought I would take a moment to show you the five lovely woven card insert I received this year. So I'll start by saying that I had no light to turn on (power was off) and after I took the images, my battery in the camera died. So my apology for pictures slightly askew but I was under rather limiting circumstances! Like my friend Lynnette , I also received this lovely card from our friend Joan in Kamloops, BC. Joan does beautiful weaving and I have spent an enjoyable time at her home for a lunch and afternoon in her studio where we looked over her looms, projects and Joan's other interests such as book binding. This card is from my friend Louise of Lumby, BC. Louise is a weaving dynamo and is one of those people you *hate* to follow at a guild meeting's show and tell session. She brings in a haul of stuff and you wonder where she finds the time to do it all? Especially since she works and helps to run a cattle ranch. Yup, you gotta get your show and tell in before hers every time! (Yup, it's crooked. See excuse #1 above) This card insert was woven by Lynnette of Coldstream, BC. You may have seen this and it's cousins at her blog prior to being mailed away. I'm one of the lucky recipients. What doesn't show here is the sparkly silver strand along with the white weft. I didn't have a decent light source (see excuse # 2 above). Lynnette does lovely work and I have several of her cards from past years. This card is woven by a friend who I call my 'weaving mentor' and she happens to be a GCW master weaver. Margaret lives in Lake Country, BC. This picture really doesn't do justice to the trees and colours. I have been lucky enough to have several years of Margaret's cards and each one is a delight. The last one I have to show you three times. The materials used bounced the flash and so I had to try and capture the overall effect and then a close up of the weft and warp and that didn't do justice to the overall weaving. Much better definition....and then a close up to show the wefts. Please bear in mind that the opening in this card is 2 inches across. Susan, Bruce and Connor, the dog. First things first! This was our front yard this afternoon. After it was dark, the snow kept on falling! We are officially stuck and can't get out of the driveway. Oh, well... we'll dig out, or call for snow clearance help ....our driveway is 300 feet long. Happy Solstice! After I lace the rod into place, it's ready to wind on! I must say that warping on the Louet is pretty darn nice....it just rolls on as you follow their steps. The resulting warp has beautifully even tension. Here we are ready to go! I got under way and it was going well. I had my treadling plan all worked out and toodled along. The first one was just to get the feel for the process and so the second was my 'serious' attempt. I got it all woven in one session for an even beat and I was feeling good. I wanted it to be a balanced weave at 20 ppi. It measured 18 under tension, and 19 off tenision. So far so good! Now I cut off and plan to finish ends and wash it to get the 20 ppi. How had I missed that?? Also the ppi on the layer was now off with such a thick mistake on the bottom layer. I decided that this whole thing was a learning experience even with the 'mistake' so I'm going to go ahead and twist the ends and wash it and see if the earlier areas do have a balanced 50/50 weave. So I still have half the warp to work with and will do a third. But I'm going to try using a mirror to periodically check underneath. I also understand that I may need to do another warp as I work my way through this 'DW' Study. The DW sampler is on a large sheet on insulation board (left over from a project) and I have marked it in one inch increments. I attach my handwoven to a given line and pin securely. I then use my fringe twister and slip a darning needle into the over hand knot at the given length line. My knots are all even across! I don't do a final trimming of the tassles with a rotary cutter until after the washing and pressing. I'll show you that at a future time with this sampler. The fringe twisting is still ongoing. I have some great news to share! We have a new addition to the family. I had a delivery to my door on Friday by UPS and my new table loom, Louet's new Jane loom has arrived safe and sound just ahead of the major snow storm. She's assembled and now is waiting for her additional heddles to come via the post before the shafts are added and adjusted. Her debut will be as soon as she is appropiately 'dressed'. So if you are buried in snow like us, take heart... the daylight now gets a bit longer with each and every day. Its all going in the right direction. Just a quick update today: this is scarf number 3 and the weft is a silk cashmere blend from Treenway. Its a bit more beige that this photo shows. The feel of the scarf is lovely as you can imagine. I think for number 4 I will use a steel grey silk yak blend I found in the bottom of my silk storage box over another tencel weft. These scarves are taking a lot more time to weave due to their complexity so might as well 'go big or go home'! The pattern is really neat and the opposite side is simply a mirror reverse of the front. Its actually very easy to spot a mistake due to the clear pattern definition. On the personal front: we have just undergone 3 full days of no water in the house and I can't tell you how luxurious a shower was yesterday. The pump for the well died and it chose freezing weather and a snow storm in which to do it. So $2,000.00 later.....I got a pump for Christmas! Try something today: consciously think every time you turn on a tap, flush, or even wipe a counter. Yup, we reply on indoor plumbing a great deal and it contributes tremendously to our quality of life. All Washed up.... and Ready. So the towel warp is off Lilibet and now hemmed, washed and pressed. I got 9 towels from 10.5 yards: two of each colour, plus a third of the beige. I decided against horizontal striped borders as its a tight and busy pattern as it is. When it came to hemming, I also decided to hand sew as opposed to machine sewing so not to produce a visible stitch line. I wanted a smooth clean lines and it worked well . To review: the pattern is by Laurie Autio from a Complex Weavers compilation disc. Its 10 shafts and 10 treadle pattern in 2/8 cotton, sett 20 epi. Less than I wanted but it seems to have worked nicely. The pattern tightened up but no excessive shrinkage. The floats mean its absorbent and it helps to keep the warp colours intact for small runs. Equally attractive front and back! The different coloured wefts change the whole look of the cloth. Here we have side by side views of both sides of the honey beige towels. Then lastly, the royal blue front and back. I think its the more dramatic of the colours. Would I use this pattern again? Yes! I would use a 22 epi sett next time and try a different gradation of colours in the warp. Lilibet is naked right now but won't be for long! I'm doing a small double weave sampler and will be planning the project and pulling the warp (hopefully) tomorrow. I love linen....the smoothness of it, the sheen, the cool touch. GCW stands for Guild of Canadian Weavers and my friend Lynnette is the weaving exchange coordinator. I got my parcel in the mail a few days ago and what a treat! I submitted six towels and received six back, out of the nine participants. But we receive information sheets on all nine and Lynnette also produced a CD with all data and photos for every participant. Very professional! The terms for the exchange are quite generous. We will find out early in the new year what the new weaving exchange idea will be and then we have until October 31st to send it in. Lots of time... We send in a cheque to defray postage costs and agree to produce records of the entries for each item we mail in. So far the exchanges have included: full sized tea towels in a registered tartan, greeting cards with woven inserts ( see them here Dec.9th entry) and this year, the guest towel. The exchange was started to have actual weaving happening within the national guild and to commemorate the Guild's 60th anniversary. I was president at the time and thought it a great idea and it seems to be one that is now benefiting all members as paid up members have been receiving a photographic record of the previous exchanges. As one company says "membership has its rewards!" The white towel on the top of this entry is one that I wove and chose to keep as a record of what I entered. It's a fancy twill using a 2/16's cotton warp, sett 36 epi and most of the towels I wove had various linen wefts; some had mercerized cotton. This towel was woven by Yvonne of Prince Edward Island and she calls it her 'country hand towel'. It's a delightful mix of rustic colours, 2/8 cotton, in a turned twill. I thought of you Peg when I saw this one! It's crackle in rich tones. It was woven by Chantal in St. Gilles, Quebec, using 2/8 cotton. My husband really likes this one. It brings up the interesting talking point about why men won't use a hand towel, particularly if its white! But I think mine would use this and the country towel. ( so why not use soap and you can dry your hands on any colour!?) But this topic has come up elsewhere also and became a challenge for the next weaver. This 'men's guest towel' was woven by Norma of Windsor, Ontario. She used 2/16 cotton and 2/22 cottolin for weft in this 'turned taquete'. Norma has completed three of four levels of the GCW master weaver program. Blogger has turned two of the pictures and no matter how many times I try to reload, they come sideways! ( if anyone knows how to stop this, please let me know.... thanks) The pretty towel above was woven by Genevieve ( who I *think* lives in Quebec) using a rosepath threading. 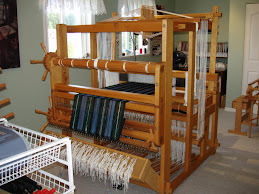 She used linen and 2/8 cotton in the warp and mercerized cotton weft. My friend Louise wove M's and O's using 2/8 cotton warp and a 2 ply line linen weft in a Christmas green. Louise has completed three of four levels towards her master weaver with the GCW. She has the hardest level to do next but I have no doubt that she will do it. Last, but by no means least, Lynnette's guest towel with cottolin warp and doubled singles linen weft in a pale blue. The pattern taken from 'Worst's Foot Treadle Loom Weaving'. An old stand by that is just as relevant today as it was in the 1920's. I have personally used this draft for towels some years ago and they were snapped up at sales for Christmas's past. Lynnette has completed two of four levels towards her master weaver. She too will reach her goal and most likely well ahead of me. Hubby and I are off tomorrow for a dinner and theatre package and will be seeing a live play called 'Having Hope at Home". It part of our Christmas gift to each other this year. Should be great fun and I'll share how it went next post. 10 1/2 yards in length and I have 9 towels of 34" in length each (before hemming) and a good selection of samples for sharing with friends. The warp roll (including some of the back loom waste ) measures just a smidge under 1 1/4 inches on the front cloth beam. From the top of the full cloth roll to the bottom of the beater bar, is two inches of space. The Louet Spring doesn't really hold a great deal of cloth. But if I was to prepare another 2/8 warp, I reckon I could put on 12 or maybe 13 yards but that would be the max. Finer yarns maybe 14 to 15 yards? Look at how close I was able to weave to the back warp rod! The shed was 1 1/2 inches still at this point. I can't get this close on my other countermarche. It laid nice and thick on the treadles! You really feel like you have accomplished something when you pick it up and feel the weight. So before I started to serge the towels apart, I measured the total loom waste. This is the back loom waste and it's just a bit under 15 inches. I probably could have woven a couple of inches more but I was 'done' at this point. This is the front loom waste after I had slowly but surely undone all the knots. It measures approx 10 inches. I could maybe shorten the tying ends by an inch next time. I was a bit generous this time. So that's 25 inches of loom waste for this project. I allow 18 to 21 inches on my other countermarche so not too bad! So I serged the towels apart and tomorrow I will prep them for hemming. They will be back here when they are all sewn and washed and pressed.